WPI’s superstar researchers Lindsay Lozeau and Todd Alexander never pictured themselves as cofounders of a company that is poised to change the way the medical community considers stopping infections. Their company, AMProtection, has gone through a few changes and pivots to arrive at this point—starting down the road to bring to market a urinary catheter with antimicrobial peptides that will reduce infections without increasing antibiotic resistance. Eventually such a device could save patients the painful and sometimes lethal infections that can happen from catheters. Alexander and Lozeau at work in the lab. Product development isn’t a speedy process, nor should it be. But before a product even becomes an idea, it’s often just as a whisper. How long does it take to go from concept to reality? Lozeau and Alexander share some insight to the twists and turns that give an idea some legs. Alexander graduates from WPI with a BS in chemical engineering. He decides to pursue an MS at WPI. Lozeau graduates from the University of Rhode Island with a BS in chemical engineering. Alexander is the tour guide on Lozeau’s WPI tour. When she arrives to begin her PhD work at WPI, Lozeau doesn’t have a project. Dean of Graduate Studies Terri Camesano asks her to collaborate with Alexander on his project. Alexander thinks of ways to prevent food-borne illness with human antimicrobial peptides. Lozeau’s research focuses on antimicrobial peptides that will work attaching to collagen for wound dressings with biopolymer-tethered and dressing-tethered peptides. The work is related to Alexander’s, but not directly. The pair are the only two taking qualifying exams in the spring of 2013. As an instant study group, they realize they have a mutual admiration for each other’s work ethic and grasp of science. Although Alexander has no intention of getting a PhD, a fellowship with the Integrative Graduate Education and Research Traineeship (IGERT) cohort changes all that. Lozeau happens to be in the same cohort. IGERT is the highly competitive National Science Foundation’s flagship interdisciplinary program for PhD scientists and engineers. 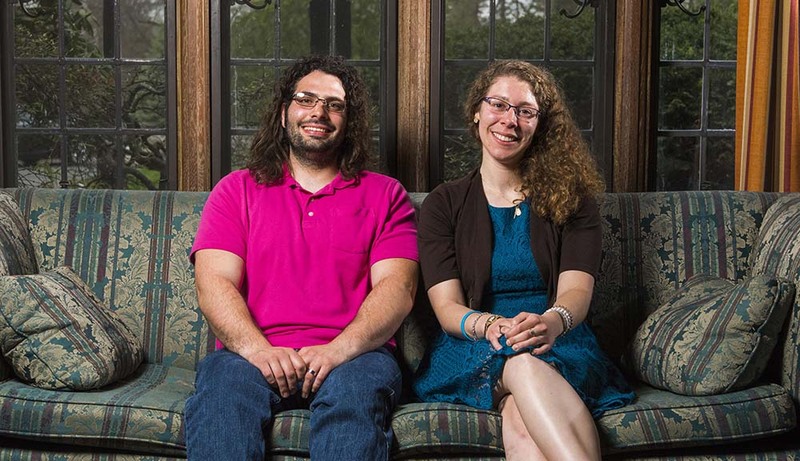 “I wasn’t planning to get a PhD, but IGERT was too good an opportunity to pass up,” he says. Eventually, both scholars also secure grants and assistance through NSF’s I-Corps program. They both joke that on the day Alexander realized he could start a company, Lozeau was the person in closest proximity in the room to him, so he looked at her and asked if she wanted to start a company with him. He knew he couldn’t do it alone and that he needed a team. She said, "Sure," but neither really knew where the company was heading. Alexander gives a presentation at The Venture Forum’s 5-Minute Pitch contest for AMProtection. At this point, the pitch is focused on orthopedic devices that are inside the body. AMProtection doesn’t win the pitch contest, but does grab the poster presentation prize. They continue to focus their research, experimenting with applying the antimicrobial peptides to various materials. Alexander’s I-Corp fellowship galvanizes the pair and helps potential funders understand the direct use of the product. Again entering the 5-Minute Pitch contest, AMProtection’s pitch gets top billing for the poster prize once again. The duo continues to sharpen its focus and presentation skills. One of the biggest changes happens here: the company’s pivot from orthopedic use to catheter-based infections. The changed focus is backed up by dozens of customer interviews and business model development. AMProtection files a provisional patent. Lozeau and Alexander start the first round of funding and continue to gather information from mentors, business leaders, and faculty advisors. 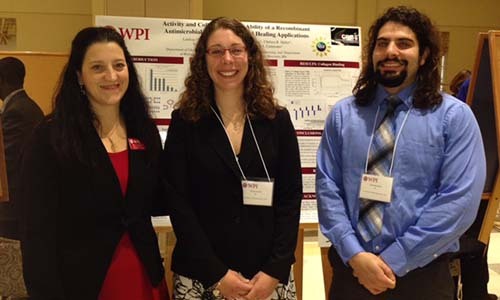 They gain steam as they notch a first-place spot in the i3 pitch competition at WPI. The third time’s the charm as AMProtection returns to The Venture Forum’s 5-Minute Pitch contest and walks away with first place. They also capture the poster presentation prize. In December, AMProtection closes out the year with a first-place finish in the TechSandBox Pitch competition. There’s no doubt balancing the development of AMProtection and completing a PhD is challenging. Although both have the same common elements and research in mind, the final goals, outcomes, and requirements of both undertakings are distinctly different. Already a close pair, they see each other’s reactions under real pressure and the results impress them. “When you share a traumatic experience of a PhD you bond,” jokes Alexander. In November, Lozeau finishes her PhD studies in chemical engineering and soon begins teaching as an adjunct professor at Quinsigamond Community College. Alexander is on track to finish his PhD studies in innovation and entrepreneurship in biomolecular engineering in the summer. AMProtection begins a new round of seed funding to get ready for the next stage. The product needs to undergo animal testing next on its way to potential human use. They will continue to look for partnerships and to secure patents as their platform for this innovation grows. It’s cool to have the path in front of you to pave rather than walking on a paved path. In our case, having opposite personalities works. Just find a business partner who challenges you and will make you better. We are [opposites] but we complement each other a lot. It’s important to find the right team and to find the people who will walk through the fire with you. 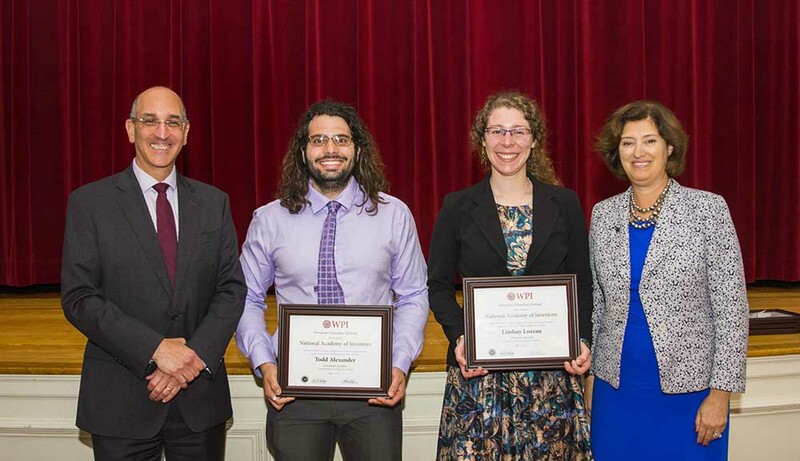 Lozeau and Alexander were among 42 WPI students who became honorary NAI members after filing for patents last year—the highest numbers in WPI’s history. They were honored in May at the annual meeting of WPI’s chapter of the National Academy of Inventors, which was attended by Drew Hirshfeld, commissioner for patents at the U.S. Patent and Trademark Office.